Billions of honeybees are still dying off, putting our entire food chain in danger. Bees don’t just make honey — they are a giant, humble workforce, pollinating 75 percent of growing plants. However the United States still hasn’t banned the toxic systemic pesticides that have been killing them off for the past eight years. A ban is possible. After a mega Avaaz campaign last year, the EU banned this group of poisons that multiple scientists blame for bees’ rapid demise. Right now chemical companies are furiously lobbying U.S. authorities to stop action. But insider allies say a massive public mandate could tip the scales toward a ban. Let’s give it to them! If the U.S. moves, it will set in motion a ripple effect throughout the rest of the world. We have no time to lose — members of the White House’s bee task force will report their proposals in days. This is not just about saving bees, this is about our survival. Sign the emergency petition now — let’s build a giant global buzz calling for the U.S. to outlaw these killer chemicals, before the honey bees are extinct. Bees are vital to life on earth — every year pollinating plants and crops with an estimated $40 billion value. Without immediate action to ensure bees’ continued pollination, many of our favorite fruits, vegetables, and nuts could vanish from our shelves, and one third of our food supply will be gone. Think about it: Everything from avocados to zucchinis depend on our honeybees. Recent years have seen a steep global decline in bee populations. Some bee species are already extinct. In California alone, the biggest food producer in the U.S., beekeepers are losing a third of their bees each year. 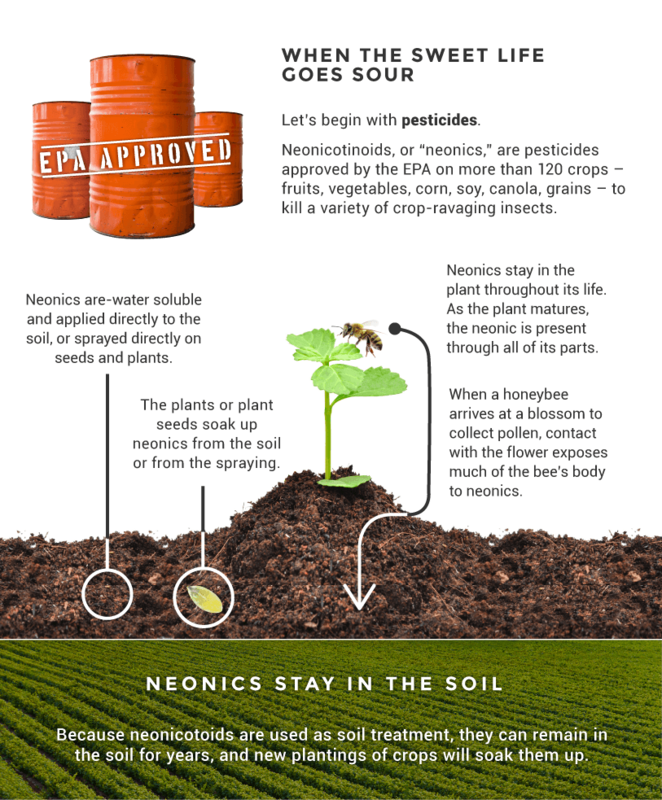 But the Golden State has postponed its reevaluation of neonicotinoid pesticides until 2020. Scientists have been scrambling for answers. While some studies, often funded by the chemical companies, argue that colony collapse disorder may be due to a combination of factors including disease, habitat loss, and toxic chemicals, powerful independent studies conclude neonicotinoid pesticides are to blame. These poisons are now in our rivers, and they impact developing brains. We don’t want them anywhere near our food supply or our bees. It is this startling evidence and effective campaigning by Avaaz and partners that won the EU ban. The U.S. Environmental Protection Agency (EPA) is required by Congress to regulate toxins, but for years, under the influence of big chemical companies, they’ve fudged the law. Now the White House’s “Pollinator Health Task Force” could get the EPA to cancel the pesticides’ registration so they can’t be sold in the U.S. This is our chance! The task force reports in days. Already 3.2 million of us around the world have backed this campaign. Let’s urgently build an unprecedented 3.5 million-strong petition to save the bees and deliver it with strategic advocacy and media to stop a back-room deal that only benefits big business. Sign the urgent petition. We can no longer leave our delicate food chain in the hands of chemical companies and the regulators who are in their pockets. Banning these pesticides will move us closer to a world that is not only safer for us, but also for other species we care about and depend on.